Lighting options have come a long way since the old incandescent bulbs. For a while, compact fluorescent bulbs, or CFLs, were the new, energy-efficient option. Today, however, LED bulbs dominate in home improvement and lighting stores. LED lights come in all shapes and sizes. Most packaging will help you match LED light output by providing wattage equivalents to incandescent bulbs. LED stands for light-emitting diodes. LED lights have been around for over 50 years. In 1962, Nick Holonyak Jr., an employee at General Electric, developed the first visible LED light. It was red. In 1976, T.P. Pearsall developed an LED that could be used for fiber-optic communication. Now there was a way to produce white light, but it was very expensive. Several Japanese scientists discovered how to combine blue, red and green LEDs to produce various colors of light. Their discovery, which later led to a Nobel Prize in physics, helped pave the path to LED bulbs that could produce bright light with a longer shelf life than traditional incandescent bulbs. As recently as 2000, LED lights had short lifespans, unpleasantly harsh glares and often flickered. They were also very expensive. In 10 years, however, that changed. By 2010, LED lights had become commercially viable. Since then, prices have dropped to more affordable levels, and the range has increased. Although the odd bulb may still have problems, most LED bulbs are reliable. LED lights are still more expensive than incandescent or CFL bulbs. But their longevity makes them cheaper over their lifetime. LED bulbs are made for just about every lighting situation. Most come in lighting powers that can be equated to those of incandescent bulbs. Labels will help you determine the wattage equivalent. There was a time when LED bulbs didn't offer fittings for every lamp. Now, types of LED bulbs come in a variety of fittings. They can be used in enclosed and open bulb fittings. If there's an incandescent, halogen (a type of incandescent), fluorescent or CFL light, there's probably an LED bulb in that style. There are standard light bulbs ideal for reading lamps, hallways and most common light fixtures in the home, including semi-flush and flush-mount lighting. Bulbs for can lights, used in recessed lighting, come in LED versions. You can get LED floodlight bulbs designed to be used outdoors. LEDs come as globe lights, good for bathroom vanities. LED kitchen pendant bulbs emit light in every direction. Candle lights, used in wall sconces, chandeliers and other decorative fixtures, come in the form of LED bulbs. LED lights are particularly suited to under cabinet lights or as lights to string along your banister. Track lighting can be done with LED bulbs. You can even get LED bulbs in vintage styles for decorative lights. LEDs come as tube lights, the lights you'd typically use fluorescent tubes for. These are likely to use the same fitting your old tube used, although older fittings may need to be rewired. LED bulbs emit light when a current passes through a tiny microchip. Once an electrical current passes through a chip, it illuminates the tiny light sources known as light-emitting diodes, or LED. The result is visible light inside a light-emitting diode bulb. LEDs emit light in a specific direction, unlike CFLs and incandescent bulbs. These emit light and heat in all directions. Because of this difference, LEDs can use light and energy more efficiently. LED lights, unlike other forms of light, usually have no filament or moving parts. Unlike CFL bulbs, LEDs contain no mercury. Breakage isn't typically a problem because there's usually no glass to break. Most LEDs are made of durable plastic, although unusual varieties come in glass. However, glass LED lights do come with a filament. Typical LED bulbs don't put out heat or UV rays, which has long been a problem with incandescent and CFL bulbs. This means light from the LED bulb won't cause your lampshade to develop an odd shadow or your curtains to fade, and it won't add heat to your room on a hot day. LED lights use significantly less energy than incandescent bulbs, and they use less energy than CFL bulbs. This is why in the long run, they're cheaper to use. LEDs last up to three times longer than CFL bulbs and 13 times longer than incandescents. If you burn an LED bulb three hours a day, it typically should last 13 years before it needs to be changed. In terms of hours, an incandescent bulb lasts for about 1,200 hours and a CFL bulb lasts about 10,000 hours. An LED bulb should last about 60,000 hours. 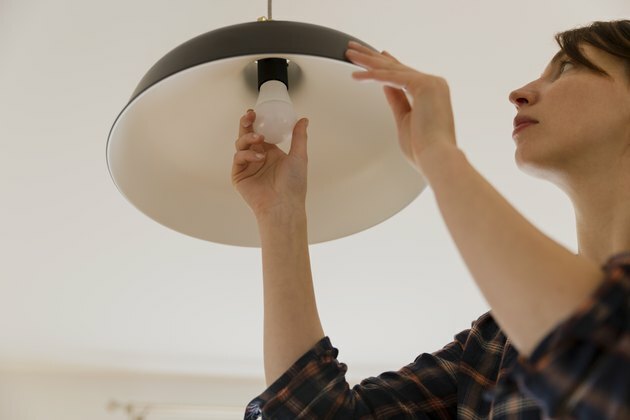 Your lights will burn out much less frequently, and you'll need to keep fewer bulbs on hand to replace them. LEDs don't burn out or fail. Instead, their light slowly dims. That's because the lumens depreciate. The LED lifetime is considered to be when the lumens are predicted to depreciate by 30 percent. Unlike incandescent and CFL bulbs, LED lights aren't hot to the touch. This is because the heat LEDs produce is absorbed into a heat sink. LED lights also work much better in extremely cold temperatures than other types of lighting. Prolonged use in extreme temperatures will diminish the life of an LED bulb, but it will work much better than traditional bulbs. The heat sinks LED lights use to absorb heat is a major reason why LED lights last so long. In fact, if your LED bulb burns out quickly, it's likely it has a faulty heat sink design. That warm white light that incandescent bulbs provide is nearly replicated in LED bulbs. LEDs come in soft white and bright white, too. And you can get LEDs in cool white, similar to the fluorescent light in schools and offices. There's also a bright white daylight color, which is good if you need to simulate daylight in your home or office. These are typically used for security reasons, although people with Seasonal Affective Disorder are often prescribed to use them in winter. LED lights come in a variety of colors. If you like your colors to change, some LED lights are capable of displaying an array of colors. As with the white bulbs, brightness will vary, so check the packaging of LED bulbs to determine the glow and brightness. You can put dimmer switches on LED lights. You may need to replace the dimmer switch you used with incandescent bulbs because they work at a lower wattage. Most newer LED lights, however, are compatible with dimmer switches installed for incandescent lights. Unlike CFL lights, LED lights don't need any warm-up time. If you put up holiday lights, no matter which holiday, LED holiday lights offer lots of advantages. They're safer. These cool lights don't run the risk of melting other decorations, making them safer and easier to use than traditional incandescent holiday lights. Plus, you won't burn your fingers on them. They're sturdier. Because LED lights are made of epoxy lenses, not glass, they're more resistant to breakage. They'll last a lot longer. No more replacing strands of lights after only a year or two of use. Depending on how long you light them, you may still be using them in 40 years. They're easier to install. Up to 25 strings of LED lights can be connected end to end without overloading a wall socket. According to the U.S. Department of Energy, lighting a 6-foot holiday tree 12 hours a day for 40 days will cost 27 cents with C-9 LED lights, and 82 cents for LED mini lights. For that same tree, incandescent C-9 lights are estimated to cost $10, while incandescent mini lights are estimated to cost $2.74. LEDs actually have nearly limitless uses in home and commercial settings. Because they're basically powered by a computer chip, the lights themselves are very small. So small, in fact, that they can be combined in clusters for a traditional bulb, used as a tiny light or used in linear fashion to make a string of lights. That's why they work so well in holiday lights, under cabinet lights or as a unique way to light up your banister. LED lights can be used on artwork and other UV-sensitive items that can degrade when exposed to traditional light bulbs. According to the Consumer Federation of America, switching your household lights to LED lights will save the average household about $8.33 per month. That doesn't sound like a lot until you add it up. Over 10 years, that adds up to about $1,000 in savings. Better technology has helped reduce the price of LED lights by about 85 percent since 2000. The typical American home has about 20 light bulbs in it. Replacing all the bulbs, at about $5 each, would cost about $100. But you don't have to worry about stocking up on new bulbs and replacing them since they're likely to last over 10 years. That's especially nice for bulbs in those hard-to-reach places like cathedral ceilings, or recessed can lights, where you probably need a footstool to reach the fixture and unscrew the cover before you can replace the bulb. LED lights can make outdoor lighting easier to do. You don't need to change the outdoor lights as often, and you can use LED lights in everything from small patio lights to walkway illumination to motion sensor floodlights. Just make sure you buy outdoor lighting for lights you intend to use outdoors. String lights are a popular outdoor feature year-round thanks to LED lights. Patio string lights can set a mood and provide pleasant background lighting without that harsh glare of pre-LED outdoor lights. You can even link multiple sets together and hang them over a dining area to extend your patio enjoyment after sunset. Even if you don't have a cover over your patio, simply install posts at two outer corners of your patio and you can string lights between the posts and your house. Using LED lights that change color has become a particularly popular feature in outdoor lighting. Some experts say that LED lights will one day be used to improve computer displays, lower glare from car headlights and be controlled by light switchboards that control not only the brightness of a light but its color temperature and color. LED lights continue to evolve. LEDs can provide virtually all of the positive features of incandescents, halogens and CFLs. Although they cost more, prices drop each year, making them more affordable. As homes get smarter and more automatic, LED lights can be part of the transformation. You can now control your LED lights from your smartphone or other devices. Several lighting manufacturers offer systems to set up these LED smart lighting features.